Designer Jerome Kaplan’s new sets and costumes for Pacific Northwest Ballet’s production of “Giselle” borrows details from the ballet’s early history. The romantic ballet, which premiered in 1841, starts with the peasant girl Giselle dancing happily with her handsome suitor. However, when Giselle discovers her beau is a nobleman in disguise (and thus out of her class), she dies of broken heart. Her unhappy end makes her one of the Wilis, supernatural maidens doomed to take their revenge on men for eternity. In 2011, PNB’s first production of “Giselle” staged by PNB artistic director Peter Boal sought to return to the ballet’s original choreography. Primary sources from Paris and St. Petersburg found by dance historians Marian Smith and Doug Fullington helped create the new “Giselle” but the company used a rented set and costumes not completely in keeping with this vision. Kaplan’s choice of colors reflect a much earlier “Giselle,” said Hascall. “You’ll see more browns, yellows, and orange." Very fine light wools imported from Europe helped create the handsome coats and vests of the young gentlemen. Besides their fluttering wings, the Wilis have the floating three-quarter length skirts that typify the Romantic ideal of the ballerina (the puffy tutu not making its appearance on the ballet stage until much later in the 19th century). The company’s costume shop occupies a fairly small space on the second floor of the school and administrative offices next to McCaw Hall at the Seattle Center. For a large costume build like “Giselle,” the work spills into an upper annex and even takes over the company’s lunchroom. When the ballet opens tomorrow (May 30), Hascall and her hard-working crew will be turning their skills to new shows for next season. “We will be starting on the new Nutcracker soon as well,” said Hascall. That ballet, with new designs by picturebook author/artist Ian Falconer, is not due to premiere until December 2015. 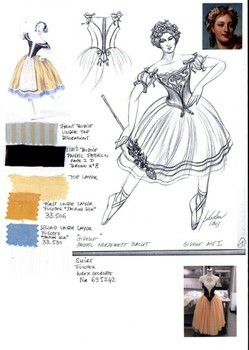 But long before that, Hascall will be collecting details from the designer, building a costume shop "bible" for the show, and filling all available space at PNB with costume production.